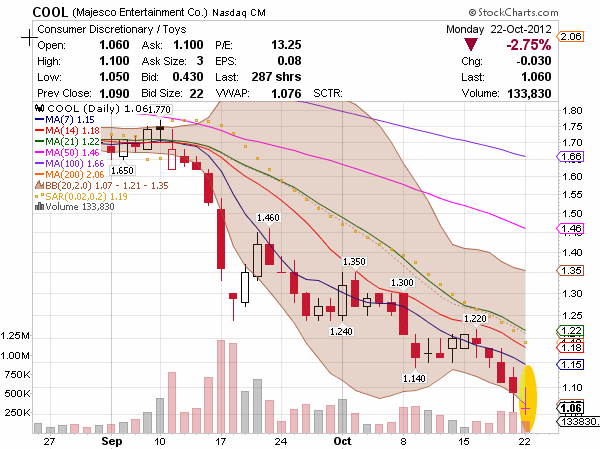 Majesco Entertainment Co. stock plunged since mid-October after the video-game publisher reported fiscal third-quarter earnings that fell well short of Wall Street forecast and a steep drop in revenues. 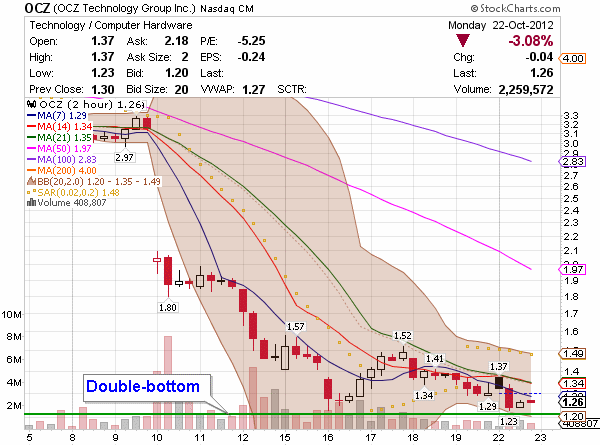 As of today the technical indicators suggest potential bounce of the COOL’s stock. Majesco Entertainment Company is a provider of video games for the mass market. Building on more than 20 years of operating history, the company is focused on developing and publishing a wide range of casual and family oriented video games on all leading console and handheld platforms as well as online, social networks and mobile devices. Product highlights include Zumba® Fitness, Cooking Mama™, and NBA Baller Beats™. 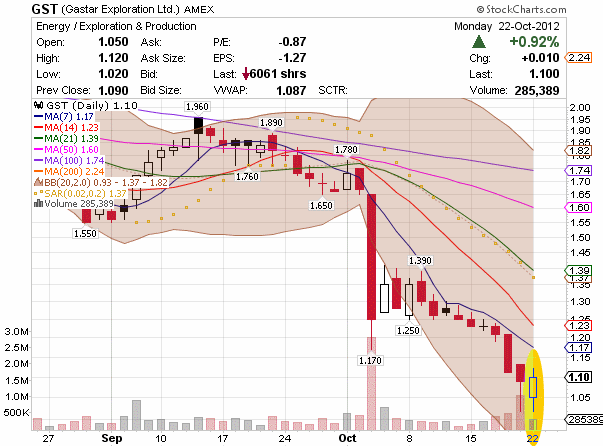 Gastar Exploration (GST) shares chopped to dollar level since Chesapeake (CHK) has filed a lawsuit against them for over a mistake made at one of Gastar’s projects. Today’s “green” close of GST shares at $1.10 is a premature signal of potential stock up-trend. Gastar Exploration Ltd. is an independent company engaged in the exploration, development and production of natural gas and oil in the United States. Gastar’s principal business activities include the identification, acquisition, and subsequent exploration and development of natural gas and oil properties with an emphasis on unconventional reserves, such as shale resource plays. OCZ Technology (OCZ) stock lost over 65% of its value since OCZ warned that results for the company’s fiscal second quarter ended August 31 will be “materially lower” than the preliminary estimate range. Following up company’s announcement of inability to file its Form 10-Q for the second quarter of fiscal year 2013 (Q2’13) and NASDAQ’s delisting notice added fuel to the fire… All those negative events already reflected in the OCZ share price as of today’s stock bounce off its 52 week low. OCZ Technology Group, Inc. (“OCZ”) San Jose, CA-based OCZ Technology Group, Inc. (OCZ) is a global leader in the design, manufacturing, and distribution of high-performance solid-state storage solutions and premium computer components. Offering the industry’s widest range of solid-state drives (SSDs), OCZ features SSDs in a variety of form factors and interfaces (i.e. PCIe, SAS and SATA) to address HDD replacement, SAN acceleration, server and storage virtualization, cloud computing, and virtual desktop infrastructure (VDI) opportunities.